Welcome to "Camping - Kathisma"
Westwards of Lefkada and in one of her better beaches, in a space sunk in the green and in the trees is found the Camping Kathisma. It abstains 12 kilometres from the capital and has near his one beautiful village, the Ag. Nikitas. In very near distance are found some of the better beaches of island in which can each one charm from them. The natural beauties of island but also the beautifully shaped spaces of stay with their brand new installations you will ensure pleasant stay and the enjoyment of your summer vacation. Lefkada has a rich history with a lot cultural events that take place over the summer. 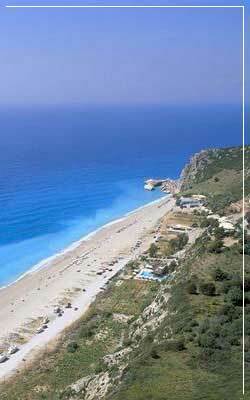 Lefkada, one of the more beautiful islands of Ionian, with amazing beaches, is found in western Greece. The navigable bridge that connects the island with continental Greece, but also the airport of Aktio, renders Lefkada a easily accessible part that provides in the visitor freedom of movements. Island with rich green but also aquamarine crystal waters, with planted graphic hamlets his mountains, they create very beautiful landscapes for the visitor.